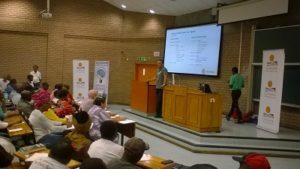 Izindaba Zokudla (isiZulu for ‘Conversations about Food’) is a monthly forum hosted by the University of Johannesburg where urban farmers meet to dialogue on issues pertaining to farming and the agricultural value chain. 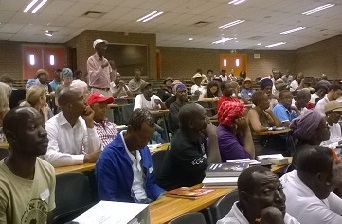 The regular meetings continue to draw farmers, agribusiness and “agri-organisation” stakeholders from Soweto, the greater Johannesburg area, and South Africa together, and is aimed at resource-poor, emergent, established and commercial urban farmers. 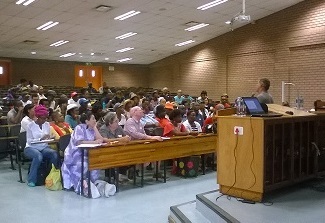 One of such events was the Farmer’s Lab held on Saturday the 14th of April at the University of Johannesburg – Soweto Campus. Dr Naudé Malan, a senior Lecturer in Development Studies at the University of Johannesburg and convener of this multi-stakeholder engagement project, gave the opening address, stating that Izindaba Zokudla seeks to create opportunities for urban agriculture in a sustainable food system by connecting all core actors in the farming value chain, particularly in Johannesburg. This is reflected in the way the project actively engages with urban farmers, entrepreneurs, academics, civil servants and other stakeholders in the city, and aims at participatory technology and enterprise development. He called for a paradigm shift amongst smallholders to create and capitalise on market opportunities, rather than dwell solely on government grants and subsidies. Gary Jackson, of Jackson’s Real Food Market, shared his experience on becoming a successful entrepreneur in the fresh produce retail sector. He opined that part of his success stems from appreciating the core needs of customers (quality, healthy and wholesome items) and those of producers (trust and fairness in pricing). Tim Abaa, a successful smallholder who hails from Orange farm, charged farmers to appreciate the limitless potential of their farming lands and enhance their farming businesses. This can be achieved through hard work and willingness to learn new farming techniques inter alia. He stressed the need to embrace new farming methods given the palpable impact of climate change on farming. The event also attracted stakeholders from government, as well as non-government organisations. Carolien Samson, head of strategy at the Land and Agricultural Development Bank of South Africa, posited that forum such as Izindaba Zokudla create an avenue for the Land Bank to strategically engage with smallholders, thus enabling the Land Bank to better tailor interventions to meet their peculiar needs. Some organisations that provide agricultural technology solutions to farmers were also present. Dr Norman Hoeltz of Indigo Media gave the final presentation, touching on the relevance of digital technology to successful farming. He introduced a novel platform, Aparate, to the gathering, explaining that in contemporary times the role of technology, data exchange, knowledge, services and skills cannot be overemphasised. This has made it imperative to promote innovative modes of digital engagement and cross-institutional collaboration. Thus, the introduction of Aparate is to champion a digital platform for the entire agriculture ecosystem comprising smallholder and commercial farmers, agro-processors, farm input providers, financial support and services, agri-business chambers, and government agencies. The aim of Aparate is to help surmount some of the hurdles to a thriving agricultural community and facilitate Africa’s realisation of agriculturally-led industrialisation supporting the global food security agenda and Africa’s drive for economic development and poverty mitigation. A key narrative from the event was that urban farmers need to embrace value-addition so that their agricultural products get high returns. The need for farmers to understand market trends so as to be able to penetrate new markets, as well as promote farm diversification, and even build their own brands, was equally emphasised. This entry was tagged agriculture, farmer's lab, farmers, farming, food, food system, izindaba, Johannesburg, malan, market, naude, seminar, sustainable, UJ, urban, value chain, zokudla. Bookmark the permalink.